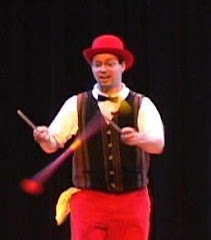 Here's a great example of an orthogonal approach to a juggling routine. Funny stuff. Another photo from this summer's show for the Bulverde/Spring Library. Taken by a library volunteer. Another post from my Bulverde/Spring library show this summer, taken by a library volunteer. I do a Balance and Motion juggling show that lines up with the Texas Second Grade curriculum, which includes a Balance and Motion FOSS kit. It's a 30-minute show aimed at demystifying juggling by showing how the physics of balance and motion makes it possible to make props fly through the air. Bring me to your school, gather your whole second grade in your auditorium or cafeteria, and put a bit of fun in your science. The Amazing Aaron's "Balance and Motion Juggling Show" created a balanced learning environment, where our kids were able to concretely relate the balance/motion TEKS and vocabulary concepts with an exciting visual dimension. The presentation, itself, was clear and concise yet thorough and valuable. Aaron's positive and genuine attitude connected with the students and made them become almost hypnotized by his performance. I hope that we can get Aaron to come to our school again next year! I had a blast doing a show for this nice new library. Lots of kids and parents turned out for the show...150 kids and 90 parents, I'm told. Plus the library had a volunteer take sixty-five photos, and was kind enough to send them to me immediately. Here are my favorites. I'll be doing an opening act for The Complete Works of William Shakespeare, a free show in Round Rock. They're playing August 5 through 22; my opener is just on the 22nd. So get there early! I failed to make it to the unicycle room this year, and this is what I missed. I frequently perform devil stick routines...but I've never seen a Devil's Triangle. Check this out, via a YouTube video.